The 2007 -2008 season in New England sports has been one for the ages. The Red Sox won it all again only three years after breaking one of the longest droughts in sports history. The Revolution reached levels of 2nd place consistency not seen in sport since Raymond Poulidor by once again losing the MLS championship game. The Celtics are off to the best start in NBA history. The Patriots only need two more wins to secure their place as the best football team ever. The Bruins? Hmmm, haven't heard much about hockey recently, so I assume all is going well. Hockey is now the sixth sport in America after Baseball, Football, Basketball, real Football, and Cyclocross and therefore doesn't get the press it used to. NASCAR? Anything propelled by petroleum is not a sport in my book. And don't get me started about ice dancing!! 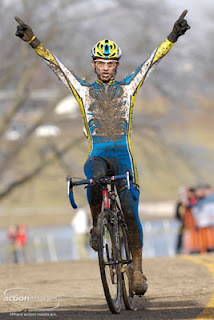 2007-8 was a great year in New England cyclocross. The best yet. More races, more racers, more teams, and more fun. And the best part is it ain't over yet. The World Championships is coming up in Treviso, Italy On January 26th and New Englanders have several native sons to cheer for. In the pro ranks, Jonathan Page has spent the year racing 'cross as a full time euro pro based in the spiritual heart of cyclocross, (not Roger Williams Park) Belgium, but he hails from New Hampshire. Check out the fall issue of Cyclocross Magazine for an interview with Jonathan He flew back from Belgium for the National Championships at Kansas City in mid December only to lose to another New Englander, Massachusetts's own Tim Johnson. I must admit, until this year I have always gotten their names mixed up but fortunately, never while announcing a race. I think I have them sorted out now. These two are our best hopes for a men's US podium spot at World's. Page was second place at last year's worlds but has usually finished between 10th and 20th in European races since then. I can't even imagine how there can be that many guys that are good enough to go faster then him over there, but they do. In the Junior ranks, repeat Junior National Champion Luke Keough will be heading to Italy to try for his first rainbow jersey. Luke is one of five brothers from Sandwich Massachusetts, all of them ride. The two oldest are going big time with the CRCA Sakonet team for 2008, and Luke won't be far behind them. Joining Luke Keough on the trip will be 17 year old Gavin Mannion from Dedham, MA. Gavin got my attention when I saw him sprint around former pro Frank McCormack to take the win at a training race this past March and made it look easy. Maybe it was, Frank has nothing left to prove and even if he did, Charge Pond training races in March wouldn't be the place or time to prove it, but nonetheless, I was impressed by the (then) 16 year old kid torching past the former pro. Gavin spent his Christmas school vacation week racing in Belgium so he now has international 'cross experience under his belt. That has to help when the gun goes off and all hell breaks loose in the holeshot. Go Tim, go Jonathan, go Luke, and go Gavin. Allez!! There are other New Englanders going also, these are just the ones that come to mind first.